These rolls have been on my mental to-make list for over two years. I finally made them and they were so worth the wait. They’re the best sweet rolls I’ve ever had or made. I wanted to make sure to get the dough just right. 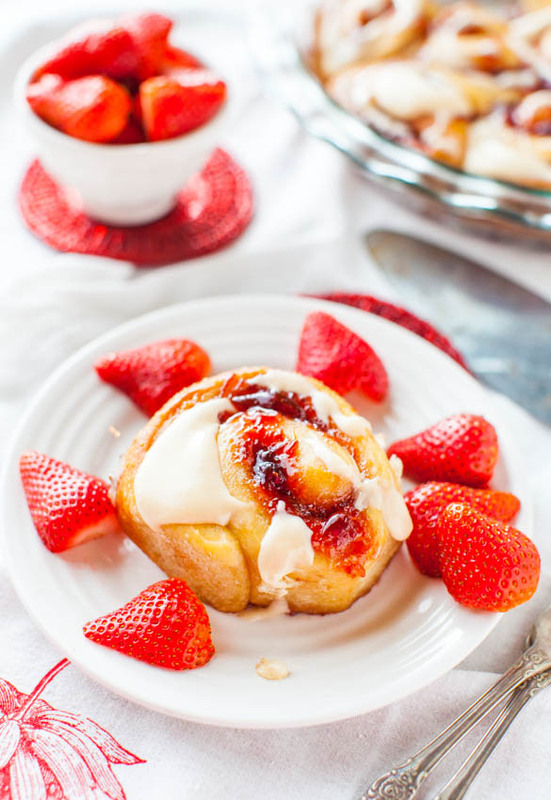 Buttery, soft, light, and fluffy is the only kind of sweet roll I want, and these deliver. I used my favorite cinnamon roll dough as the jumping off place, but downsized the recipe between 25 to 33 percent. I wanted a slightly smaller batch because honestly the smaller the batch of fatty, fluffy, frosted carbs just laying around, the better. I also cut the rolls smaller, making 20 in a 9×13 pan rather than the standard 12, for some built-in portion control. Unless you go back for seconds or thirds. That may have happened. The dough is buttermilk-based, and although I’ve made non-buttermilk sweet rolls, for the softest, lightest, and most tender rolls, I swear by buttermilk. Between the eggs, butter, and buttermilk, the dough rises beautifully and it’s my new favorite dough base. For the filling I used storebought orange marmalade, but if you have homemade, even better. I love the tiny bits of orange rind that are almost imperceptible in the finished rolls, but there’s just enough to add subtle texture. 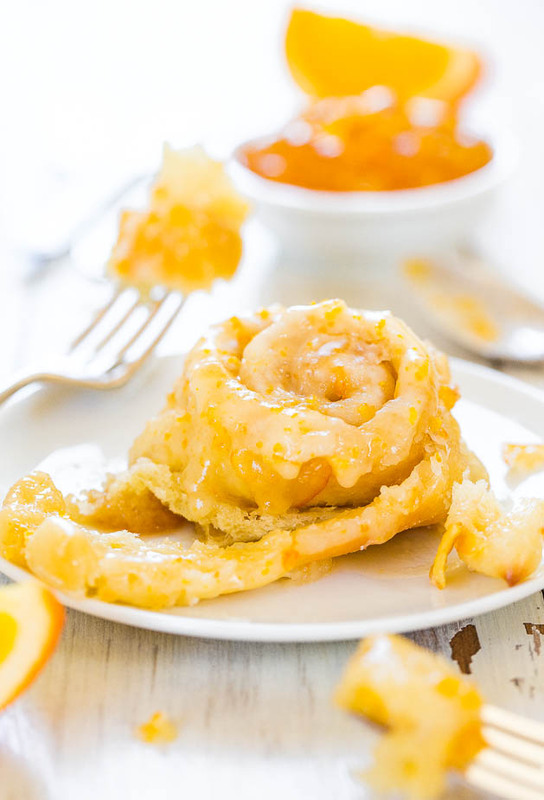 The glaze is an orange juice-based confectioners’ sugar glaze, with orange zest stirred in for an extra pop of orange flavor. I also made the glaze using lemon juice when I was testing the recipe and if you’re a lemon fan, it’s a fun twist. The glaze is poured on as soon as the rolls come out of the oven. It soaks into the nooks and crannies and adds more moisture and softness to the already moist, soft rolls. Some glaze will drip through onto the bottom of the baking pan so make sure to spoon it up and don’t waste of drop of that liquid gold. They’re so soft, moist, tender, wonderfully sweet, and just irresistibly good. They’re one of the best things that has ever come out of my kitchen. Try them and you’ll be a believer, too. I promise. People here may have fought over who got the last one. 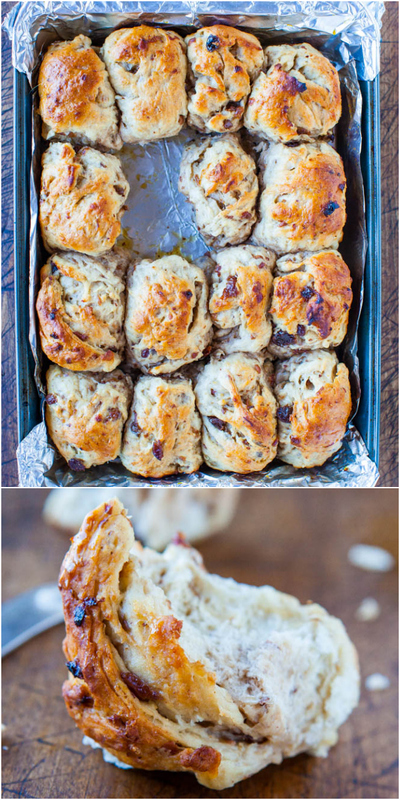 The rolls are sweet, buttery, soft, light, fluffy, moist, tender, and one of the best things ever to come out of my kitchen. The recipe looks long, but I have written out every last detail so the rolls turn out perfectly for you. Read the recipe at least twice before starting, and the only ‘unusual’ item is in Step 16, unwaxed dental floss. Very helpful for not squishing the rolls and making clean cuts. The dough is buttermilk-based and I swear by buttermilk for the softest, lightest, and most tender rolls. There’s an option to make the rolls as overnight rolls. Start the dough at night, roll and shape it, and refrigerate until you’re ready to bake the next morning so you don’t have to get up at 5am to have these ready with your first cup of coffee. Dough – To the bowl of a stand mixer fitted with the dough hook (or use a large mixing bowl and wooden spoon and your hands), add 3 cups flour, sugar, yeast, salt; set aside. Add buttermilk to melted butter and warm to temperature, about 45 seconds on high power in the microwave. (Based on the type of yeast used, milk temperatures will vary. Red Star Platinum yeast calls for warmer temperatures than most, 120 to 130F; other brands and yeast call for much lower temperatures, about 95 to 105F. Heat the mixture according to manufacturer’s recommendations on the packaging. Taking the temperature with a digital thermometer is highly recommended, but if you’re not, make sure the milk is warm, not hot. Err on the cooler rather than hotter side so you don’t kill the yeast.) If the milk separates or gets a little funny looking after being warmed, whisk it to smooth it out. Add butter-buttermilk mixture to the dry ingredients in mixing bowl. In a small bowl, crack and lightly whisk the eggs, and then add eggs to mixing bowl. Turn mixer on low speed and allow it to knead dough for about 5 to 7 minutes (about 7 to 10 minutes by hand using a wooden spoon and then switching to your hands). 3 cups of flour and 5 minutes is perfect for me, but if after 5 minutes your dough is very sloppy, wet, and won’t come together, add up to 1/4 cup flour, or as needed until it does come together. However, the more flour added, the denser and heavier the rolls will be; wetter dough is preferred to overly dry. If dough is dry or crumbly, drizzle in buttermilk until it comes together. Cover bowl with plasticwrap and place it in a warm, draft-free place to rise for about 2 to 2 1/2 hours, or doubled in size. I keep my bowl inside a powered-off oven that I preheated for 1 minute to 400F, then it’s powered off. Do not, repeat do not, keep the oven on. The pre-heated, warm oven creates a nice 85F-ish environment, ideal for yeast. If your rising spot is cold, rising will likely take longer than 2 1/2 hours. While dough rises, line a 9×13-inch pan with aluminum foil, spray with cooking spray; set aside. Filling – Using a knife, evenly spread butter over dough, leaving a 1/2-inch bare margin. Add about 3/4 cup marmalade, more as needed, and smooth it with a knife. It should be a thin-ish layer; too much and you risk it leaking, but not enough and the rolls aren’t orangey enough; use your judgment. 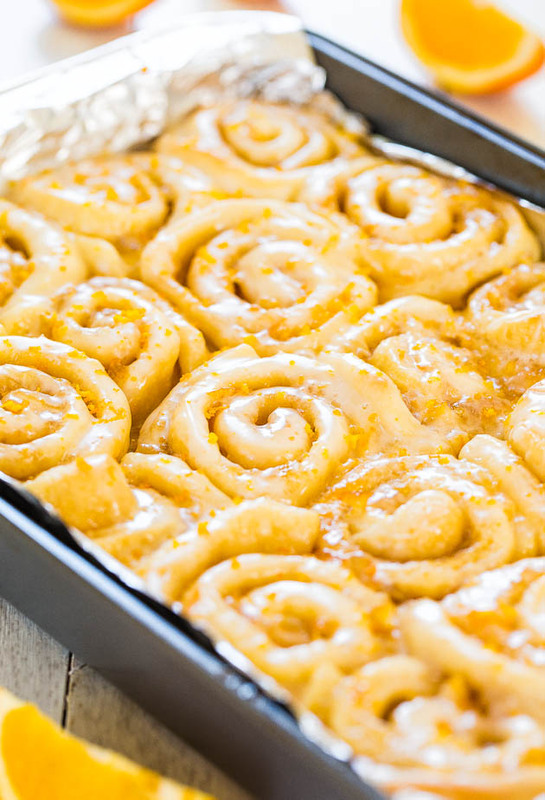 The butter and marmalade get smeared together, which is okay. Evenly sprinkle the brown sugar over the top, and lightly pat it down with your fingertips to help it adhere. Using a knife, make small hash marks so there will be 20 evenly sized rolls (about 1 to 1 1/2 inches wide; or make bigger rolls and yield 12 to 16). Hash marks create less guesswork once you start slicing and things get messier and harder to eyeball where to slice; the hash marks are nice place-markers. Arrange the rolls in the prepared pan, 5 rows of 4 rolls across. Cover with plastic wrap. Baking –For either version, bake at 375F for about 15 minutes, or until lightly golden on top and cooked through (ovens, dough, and climates vary and so will baking duration, but 1 to 2 minutes matters in this recipe). Watch rolls like a hawk and don’t overbake or they won’t taste nearly as good. 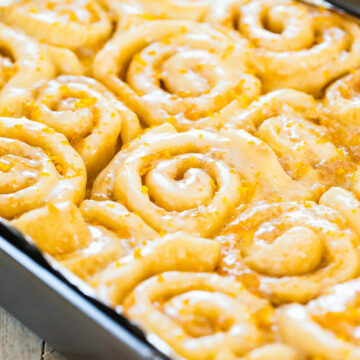 Orange Glaze – In a medium bowl, add the orange juice, vanilla, confectioners’ sugar, optional salt, and whisk to combine; mixture will be thick. Drizzle in the milk as needed until mixture can be whisked smooth and is to desired consistency. Whisk in 2 teaspoons zest; set aside remainder. Evenly pour glaze over rolls. Evenly sprinkle with remaining 1 teaspoon zest. I am new to your site and just made these for the first time and they were divine! I plan on making again for my family on Christmas. Thanks for sharing the recipe. Thrilled to hear these will be on your Christmas day menu! That’s wonderful and thanks for trying the recipe and if you try others, please LMK! I have been wanting to make these rolls since I saw them posted this summer. I also wanted to start a new tradition with my little kids this year for Christmas and start making homemade rolls for Christmas morning. I decided on these rolls for my first time at making them homemade. Wow, they were delicious and beautiful. My son is a picky eater and I try everything to get him to eat a variety of foods. He loved these and ate the last one!! Thank you for sharing!! I’ve never tried but it will probably be fine. Or you can just omit but I prefer to line so that cleanup is a snap. Could I use bread flour with this recipe? Probably yes but the rolls may not be quite as soft and tender and you may need slightly less bread flour than if using AP flour. Wowzers! Just made these and had my first warm bite. Thank you for this recipe! 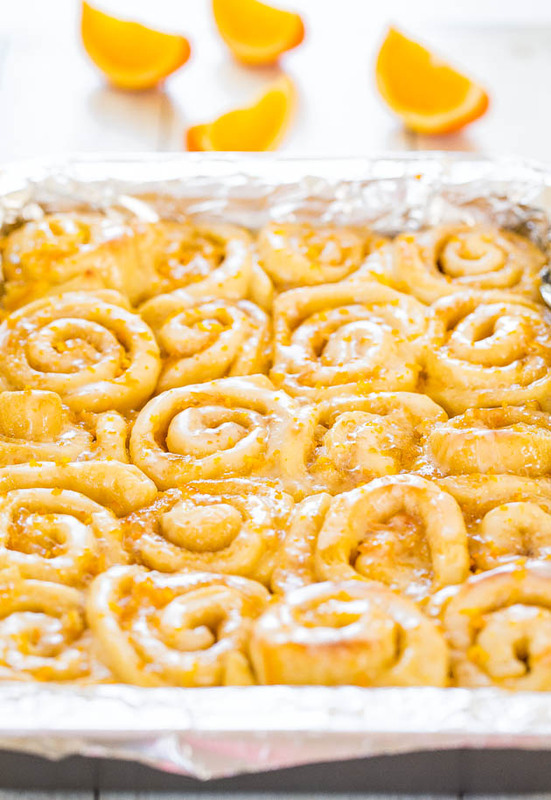 I just want to say that I am literally in shock that I was able to make these Sweet Orange rolls so easily, and they are literally the softest, sweetest most wonderful pastry/roll I have ever had, I cannot believe it! Thank you SOOOO much! I cannot wait to do the cinnamon version. I made my own buttermilk using 1/3 greek yoghurt and 2/3 milk and it worked a treat. Also your tip about putting on the oven for 1 min then turning off as a warm rising area is a great idea and they rose really well. I feel really buoyed up and excited about baking more. I feel blessed that I stumbled across y0ur web-site just from a Google search. Thanks again, you have added a spring in my baking step! I had an idea a while back for starting a little pop-up’occasional’ breakfast menu bakery and these have really given me the confidence to maybe have a proper go at it. I know i sound like I am going crazy over-the-top but I really am so delighted with these, thanks, you have a real gift, thanks for sharing it! Thanks for trying the recipe and I’m glad it came out great for you! Glad they’re the best rolls you’ve ever made and keep me posted what else you make! 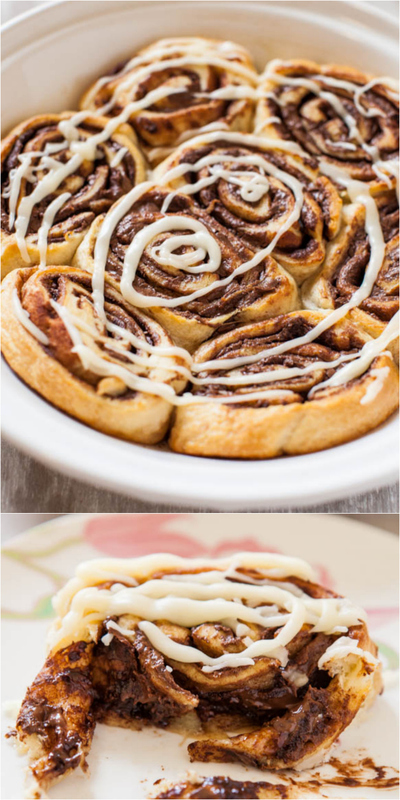 I am planning to make these for a group meeting I have this week, and was wondering if you had a recommendation for when to add the icing… would you recommend pouring it on after I reach my destination? Or before I leave home? Do you think it would even matter? 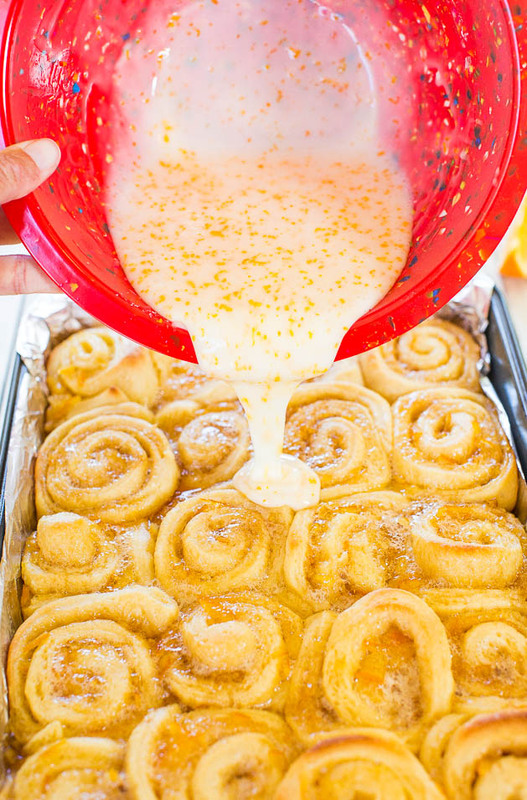 I can’t wait to try these – I love orange sweet rolls!! I really don’t think it’s going to matter that much provided you aren’t in the car for hours and hours. 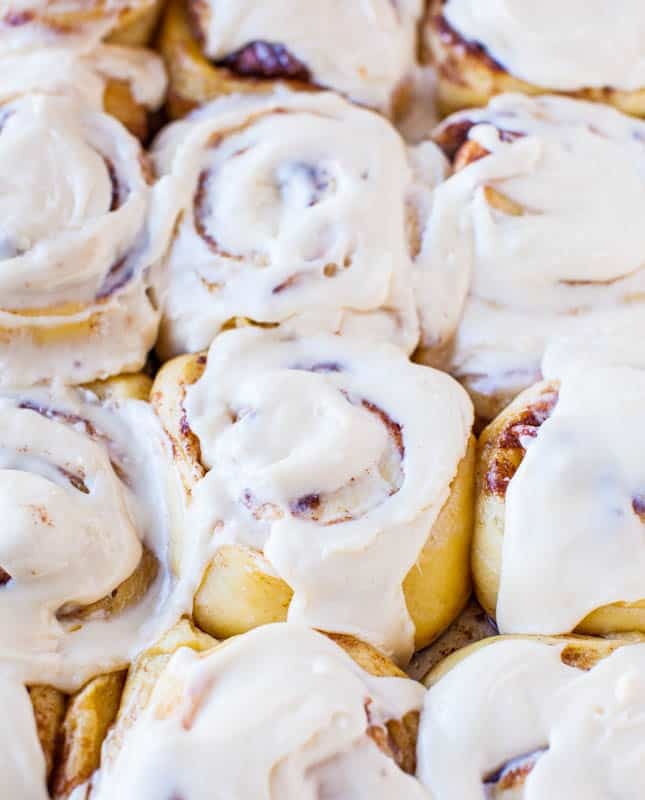 And even if you were…who cares :) They’re homemade rolls and they will be fabulous and loved by all. Enjoy! I am making these right now, but have a question? How soon after you turn the oven off, do you put the bowl in for raising? You cannot put cling wrap in a hot oven or it will melt onto the dough. Thank you. The oven shouldn’t be hot. It should be warmer than room temp is in the winter. Think 85F summer day no a/c in the kitchen, definitely not over 105F or it is too hot. Plastic won’t melt at that temp. I believe the oven is only set at 400 degrees for 1 minute then turned off – not nearly long enough to get hot enough to melt the plastic (probably takes 7-10 min. to get oven all the way up to actual 400 degrees, depending on if elect or gas). Yes exactly what you said. 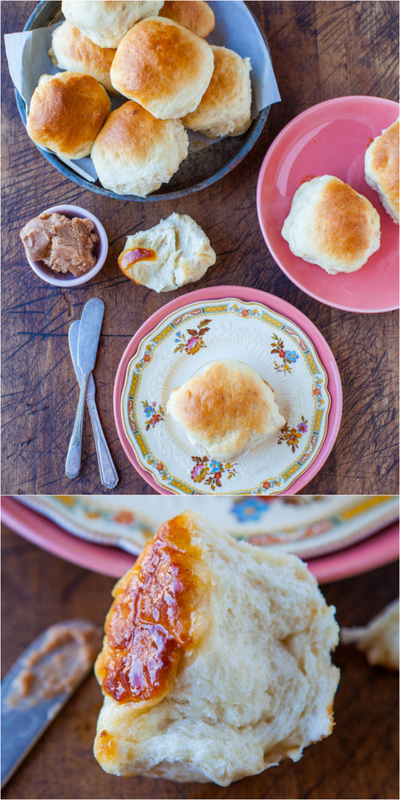 I have made these rolls several times alrady and we love them! Raspberry and lime sounds like a great twist! I’m glad you’ve made them many times and love them! I will be making this again. It is a very good recipe. I think people that are having issues with it too wet may need to let it sit longer than just one hour. I left mine at room temp 2-3 hours till it doubled. I am anxious now to make regular cinnamon rolls with it. Can this dough be frozen, after the rolls are all put together? Would there be any problem with that? I’ve only made it the way I wrote the recipe. Can’t speak to the results if you alter things. Hi! So I just made these. But while I was making these, I licked the spoon I used to spread the marmalade (of course I was done spreading :-) ). And the marmalade tasted quite bitter. I was somewhat shocked. I expected it to be sweet. But i was hopeful that the icing and brown sugar (which I actually added more in fear of the bitterness being overpowering) would sweeten the rolls enough to combat the bitterness. But after baking, everything about the rolls are perfect but they have a bitter aftertaste. Did I buy a bad jar of orange marmalade? I honestly do not think these are how they are suppose to taste based upon your description and everyone’s wonderful reviews. Any thoughts? There are some orange marmalades that are bitter, yes I have encountered those. I am sorry you got a bitter one! 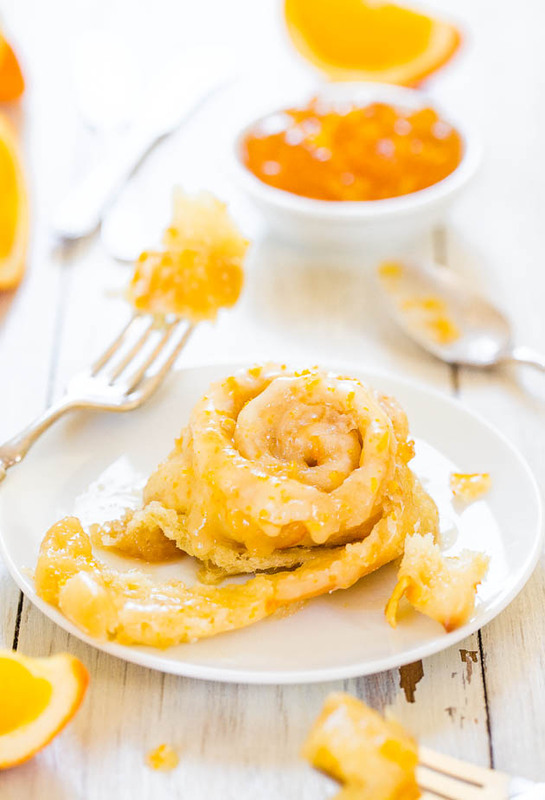 While marmalade in general isn’t sweet like typical jams, it’s definitely not supposed to be bitter either and you’re right, bitter marmalade would make the rolls taste off. The only thing I could say is that if you remake them, buy a couple different kinds of marmalade (cheap is fine – they tend to be sweeter to me) and test before using. Thanks for trying the recipe. Try to avoid marmalade with Valencia oranges as those are always bitter. I guess some people like that? Hi! Planning to make these today. Do you know how well it would work to double the recipe or would it be better to just do the whole thing twice? Thanks! Good question. I have never doubled it and making the whole thing twice is more of a guarantee for success but if you are an experienced bread-maker, I don’t think it would matter too much. Enjoy! I’ve made these a few times and they’re always a huge hit! I’ve used both the bake-straight-through method and the overnight method. Now I am wondering if I can bake straight through one day, put them in the fridge (or on the counter? ), and then just heat them up and add the glaze the next morning. Do you think they’d be just as fabulous? Thanks for the 5 star review and glad these are always a hit! 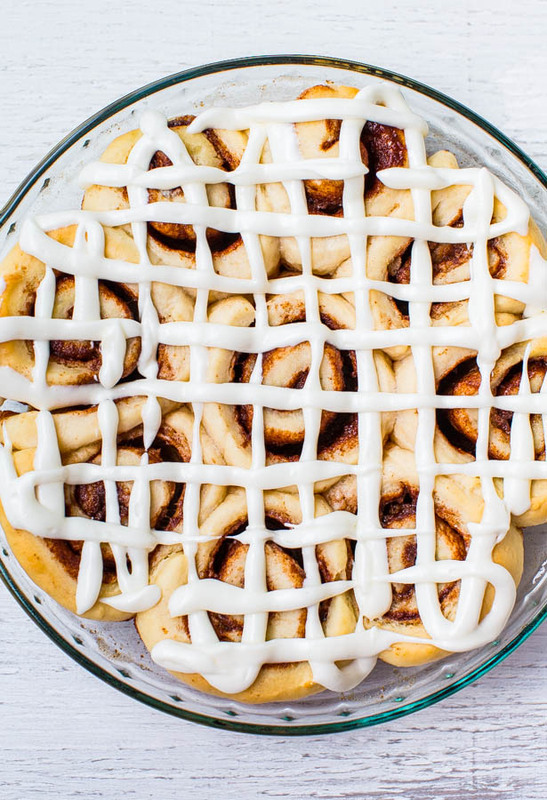 With cinnamon rolls or sweet rolls like this I do think that fresh is best but if it’s just overnight maybe they will still be just as good if you heat them up slightly and then glaze that morning. (I’m attempting my question again, can’t find it when I scroll through so maybe it didn’t post.) I’ve made these a few times and they are always fabulous, always a huge hit! I’ve used the bake-straight-through method as well as the overnight method, both work great. Now I’m even shorter on time for a morning, but still would love to make these for friends. Do you think they would be just as delicious if I baked them the night before, then left them in the fridge (or on counter?) overnight, and then reheated and added the glaze in the morning? I am a new baker and I don’t know what I did wrong,The first raise was beautiful, the second rise after the rolls were in the pan not so much. The rolls flavor is delicious but they are small and very dense, almost hard. What did I do wrong? I got your email as well. I really don’t know what to say. Usually if the first rise is fine, things will be fine. Not sure why they didn’t rise much on the second rise and that they were hard. Making bread can be tricky at times and it’s so hard to say from afar what exactly happened. Thanks for trying the recipe. I’ve made this 3x and the first rise only takes an hour, not 2-2 1/2. Also, I use a Kyocera ceramic knife for slicing. The blade is very thin. How do you know when they are cooked through as mine seemed a bit doughy on the bottom but golden on top after 15min. of cooking. I guess you just have to have a bit of experience to know when a roll is done. If they seemed doughy, then I would say give them a few more minutes. I love to bake, but I am hesitant when it comes to using yeast. This recipe is amazing. I tried it out today and I immediately ate one. Oh my goodness! I will use this recipe from now on. Thank you so much! Thanks for the five star review and I’m glad that you love these! These are delicious! I baked a pan for Christmas and popped it in the freezer. What would you suggest is the best way to thaw it? Just checked my raising dough and I’m pretty sure it’s ruined. I preheated and turned off the oven as in the recipe. The bowl is so hot and I’m sure the yeast was affected, it hasn’t risen at all. How much earlier do you preheat the oven before putting the dough in to raise? I basically preheat my oven for a few minutes, shut the oven off, and put the dough into rise. I basically preheat my oven for a few minutes, shut the oven off, and put the dough into rise. It’s supposed to be a warm environment, it’s not supposed to be so hot that it’s cooking anything or overheating anything. During the winter months, it’s hard to get dough rise in a cold kitchen on the counter which is why I suggest this trick, but if it’s more trouble than it’s worth, just allow your dough to rise in the future on the counter.